It’s the last strip of green on a coastline dominated by concrete, and residents are desperate to save it. 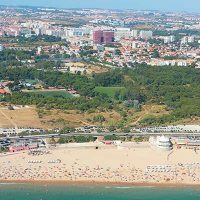 Emotive clips on “SOS Quinta dos Ingleses” show the full splendour of the green ‘lung’ between the sea and outer Lisbon’s urban sprawl, echoing with the sounds of birdsong. “Our grandchildren may never know Quinta dos Ingleses”, says the text, as the site is destined to be transformed by a plan that involves over 900 homes, shops and hotels.